Backup your complete blogspot blog and template:Blogspot or Blogger is the free and easy to use for new bloggers but it has limitation and google have own control on your blog.If you violate google policies then they can remove your blog anytime.For this reason you need to backup your blog content and template regularly.When you make changes on template of your blog take a backup of that.When you backup your blog you will get file as XML format.You can store it in your hard drive or storage memory.This feature will help you to restore your blog. 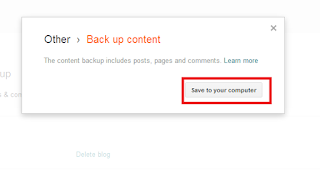 With this feature you can take backup of posts,comments.How often you update your blog depending on this take backup of your blog. 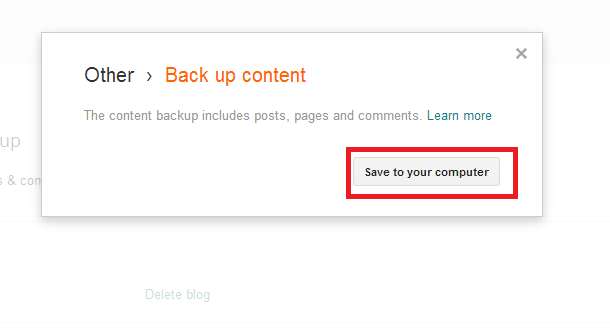 Now click on Backup Content. Your posts and comments will be downloaded to your hard drive in XML format. Last updated template will be downloaded in your computer. Now click on Import Content Then choose the downloaded XML file from your drive it will import all your blog posts and comments to new blog. At last i recommend you to keep your backup files in your google drive or any other online storage. If this post help you then please share this post using share button below.